DTM Rambles...: 3405 - Anyone Remember The Naked Brothers Band? 3405 - Anyone Remember The Naked Brothers Band? Because I clearly haven't... and yet you have a bunch of copies of their PS2 video game release for sale at numerous Dollarama stores in Montreal... in 2018. 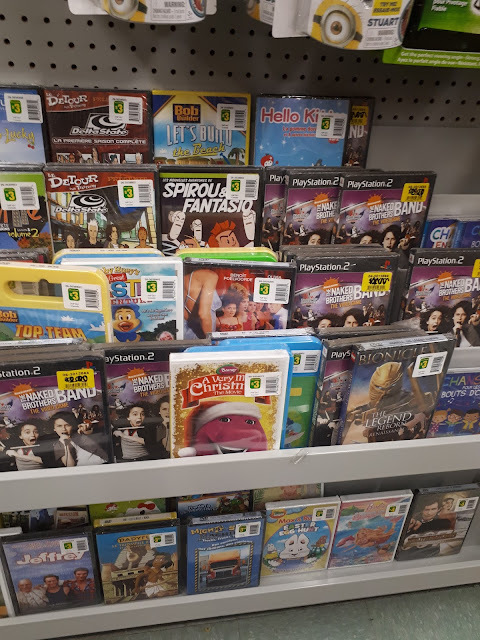 The really sad thing is that I'm not quite sure if the people running the franchise know that they have multiple copies of this ONE video game among their DVD library of children's fare. And in case anyone is wondering, no, I have no intention in ever purchasing a copy of this title. I never cared for music games like the old Guitar Hero or Dance Dance Revolution series, so a one-off thing based on a Nickelodeon property I'm not familiar with that is more than like a rubbish game to begin with isn't holding any appeal whatsoever.